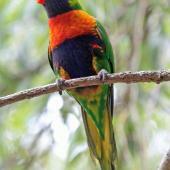 Geographical variation: New Zealand birds were predominantly of the subspecies T. haemotodus moluccanus from eastern Australia and T.h. 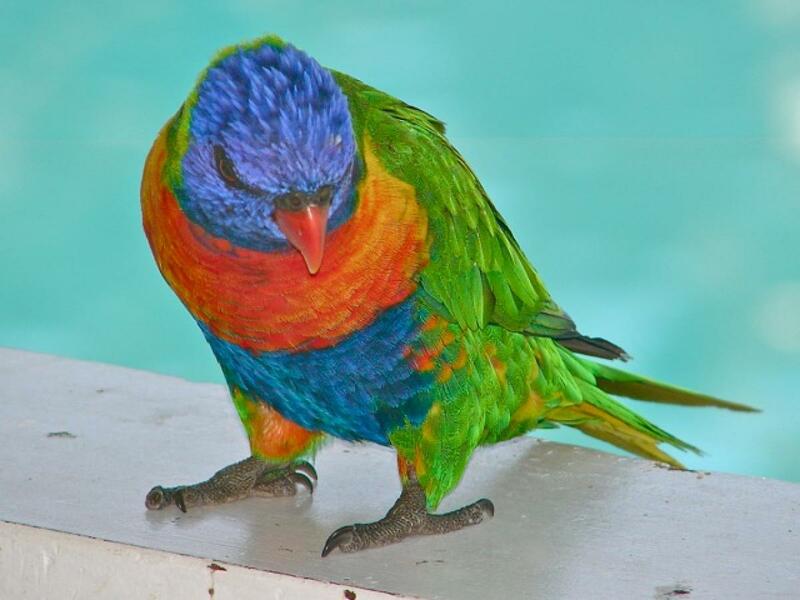 rubritorquis from northern Australia, but two captured birds showed features of subspecies T. h. nigrogularis from Indonesia. 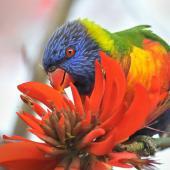 Rainbow lorikeet. Adult. Canberra, October 2018. Image © R.M. by R.M. 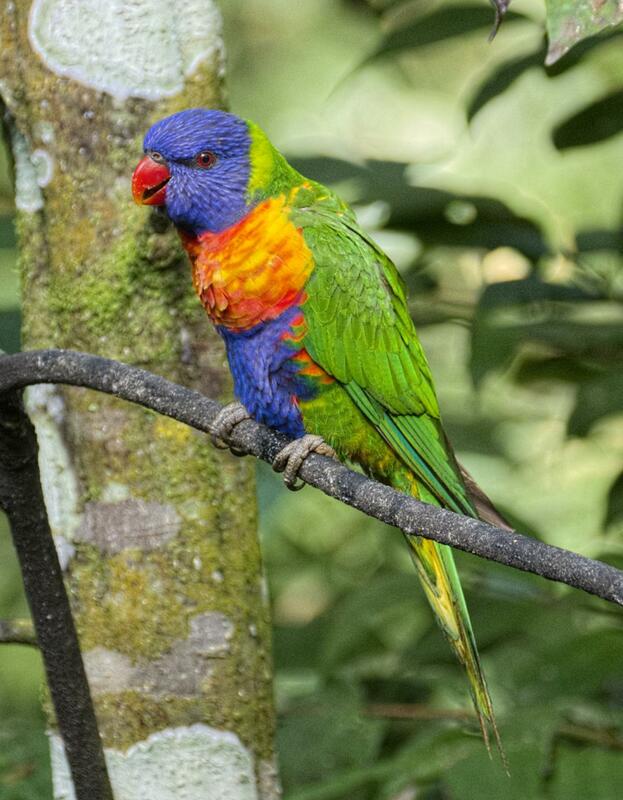 Rainbow lorikeets are brightly coloured, medium-sized parrots that are not considered to be established in the wild in New Zealand. 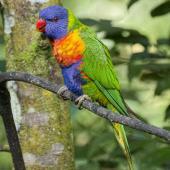 Illegal releases of aviary birds in Auckland during the 1990s resulted in a breeding feral population that has since been eradicated. 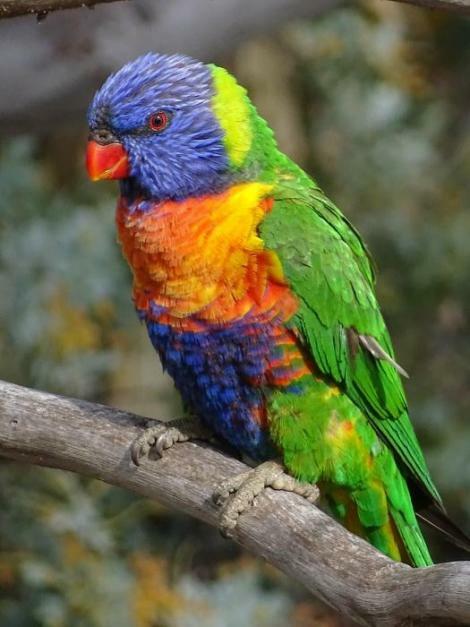 The rainbow lorikeet is considered a horticultural and conservation pest species, and is an Unwanted Organism in New Zealand. 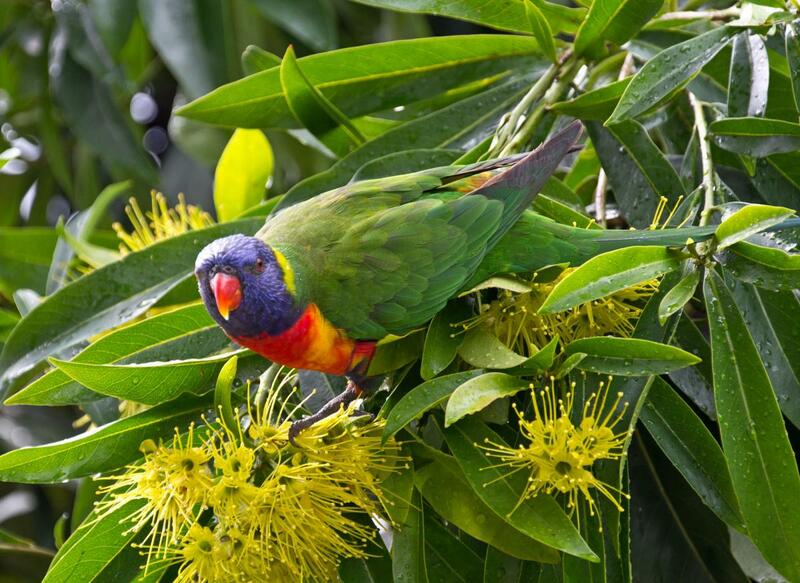 If you think you have seen a rainbow lorikeet, phone the Ministry for Primary Industries Pests and Diseases Hotline 0800 80 99 66. 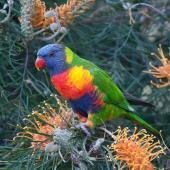 Rainbow lorikeets are slim, long-tailed, brightly coloured parrots that are similar in size to an eastern rosella. 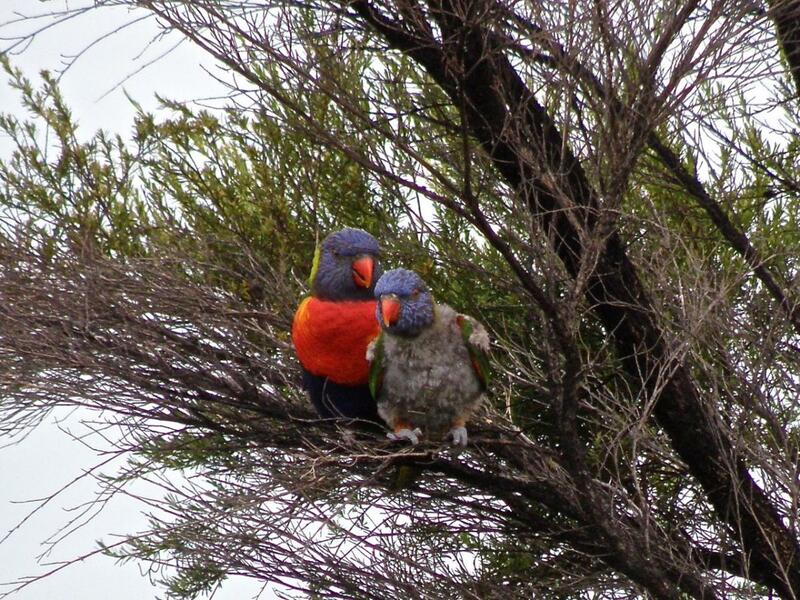 They have a bright red bill and blue head, unlike any other bird in New Zealand. 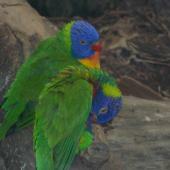 The back, wings and tail are bright green, with a paler yellow-green band across the nape (red in rubritorquis), separating the blue head from the green mantle. 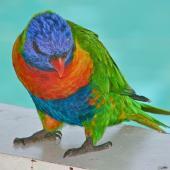 The breast is orange and yellow, and the belly is violet-blue, with yellow and green between the legs and tail. The underwing coverts are orange, and a bold yellow stripe runs through the middle of the otherwise brown primaries (main flight feathers). The eye is red, and the legs grey. The sexes are alike. Juveniles are duller, with a brown bill. Voice: continuous loud screeching and chattering. No viable wild populations are known in New Zealand. Dozens were illegally and deliberately released on the North Shore, Auckland, during the 1990s. 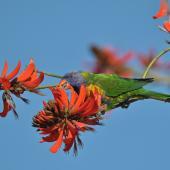 By 1999, a feral population estimated at 150-200 birds was established, with sightings from Whangaparaoa to Maraetai. They were successfully removed from the wild, mainly by live capture, between 2000 and 2002. 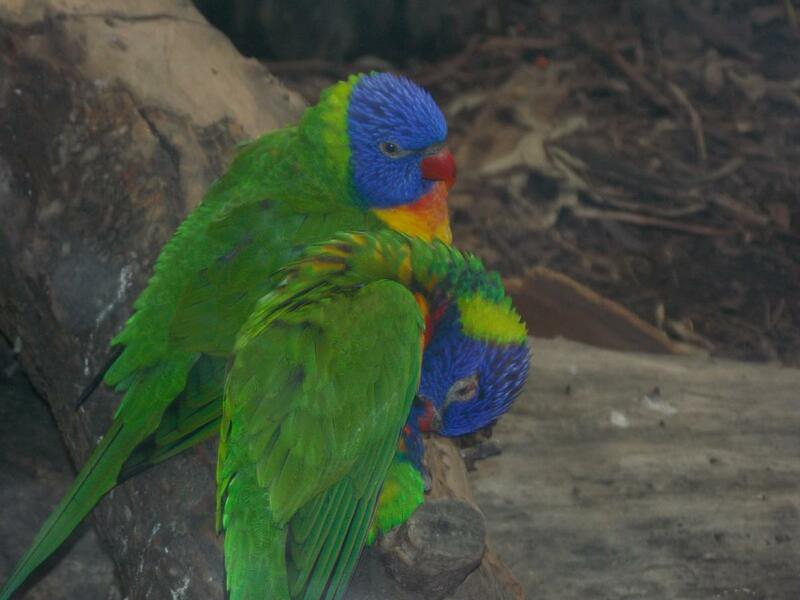 A small flock was also removed from Rotorua in 2001-02. 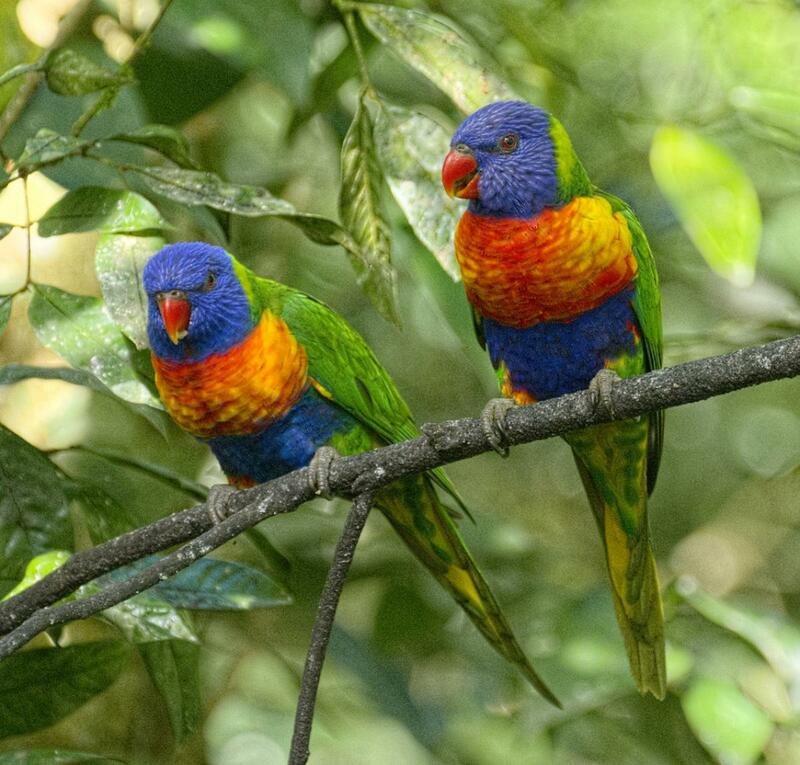 In New Zealand, rainbow lorikeets are mostly likely to occur in suburban parks and gardens, horticultural blocks, and forest edges. The natural range of rainbow lorikeets includes northern coasts of Australia, eastern Australia (from northern Queensland to South Australia; vagrant to or released in Tasmania), Papua New Guinea, New Caledonia, Solomon Islands, Vanuatu, Timor-Leste and Indonesia. They have been introduced to Perth, Hong Kong and Singapore. No viable populations are known in New Zealand. 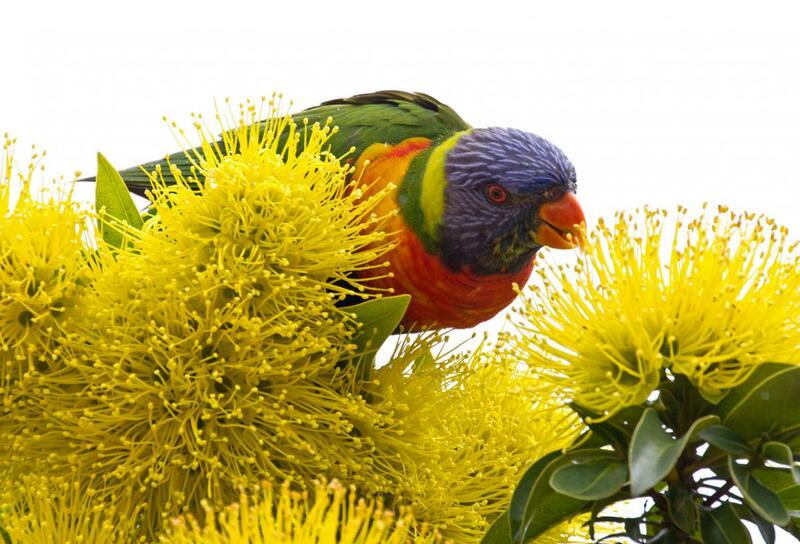 The main reasons that efforts are made to eradicate rainbow lorikeets in New Zealand is to eliminate any potential threat to horticulture, and to reduce the risk of parrot-specific diseases that they may carry infecting native parrots, including kakapo. 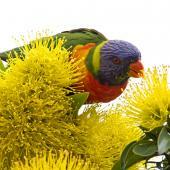 Rainbow lorikeets also compete with other nectar-feeding species; in Auckland, they excluded tui from nectar feeders. They can occur in large flocks, and elsewhere damage apples, grapes and other soft fruit. 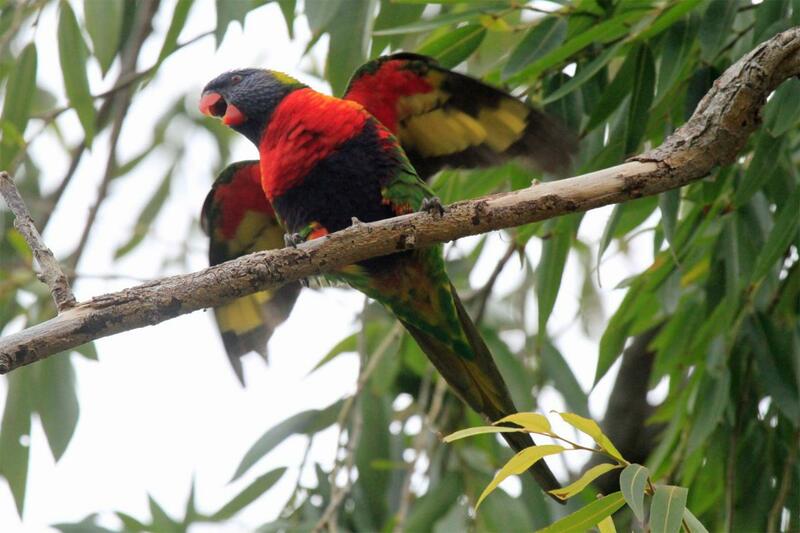 Feral rainbow lorikeets in Auckland out-competed other species for nest holes. 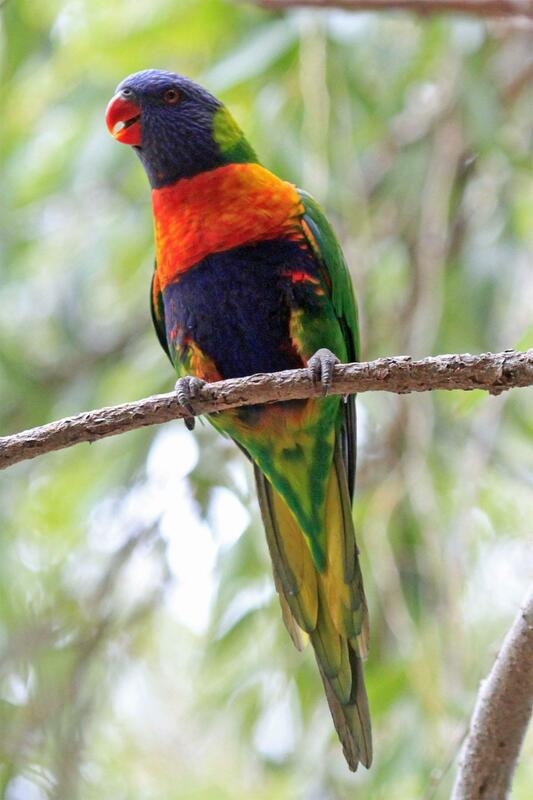 They may be kept in secure aviaries and cages, but it is illegal to release rainbow lorikeets to the wild. Few data from wild New Zealand birds. 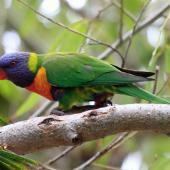 Feral birds in Auckland prevented from nesting had uncompleted nests in hollow oak trees and in bird nest-boxes. A few young birds were recorded in wild flocks in winter 2000 & 2001. 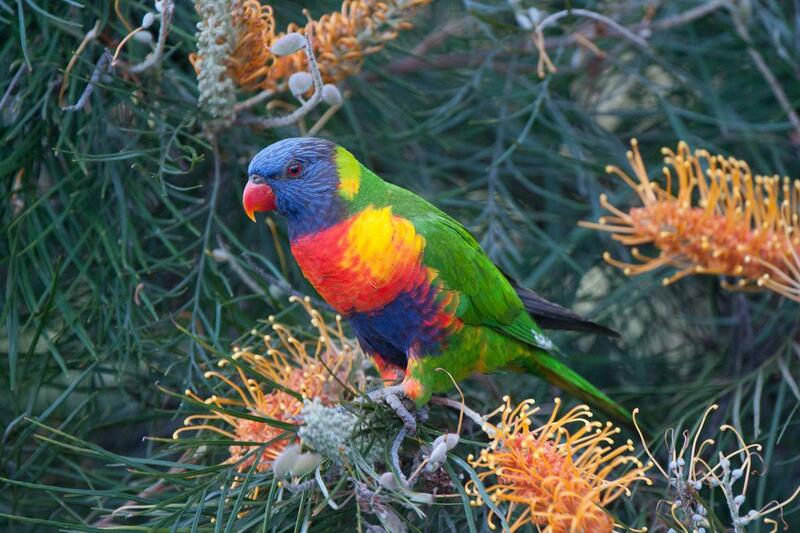 In Australia, rainbow lorikeets are mainly spring breeders, nesting inside holes in living or dead trees. 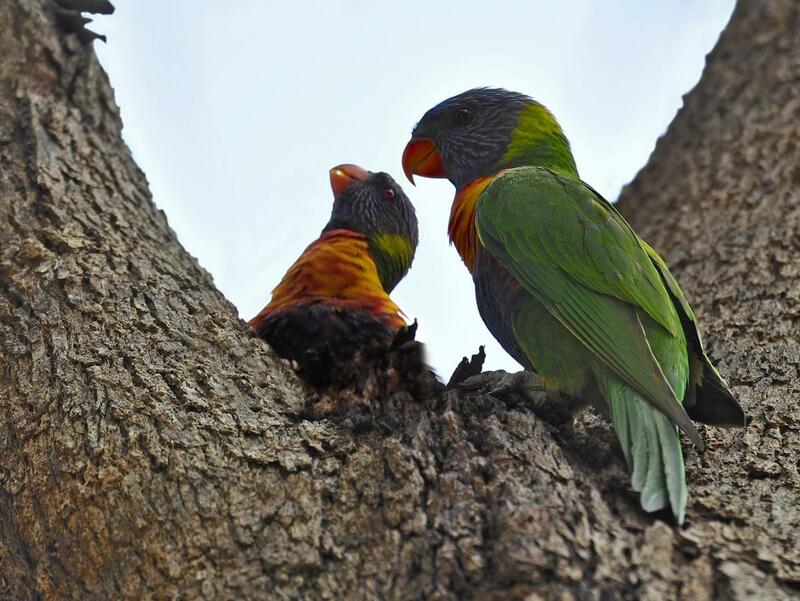 They breed as monogamous pairs, and are thought to maintain long-term pair bonds even when rejoining post-breeding flocks. Incubation is by the females, but the male frequently visits and may roost in the nest. 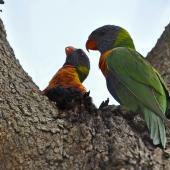 Both sexes feed nestlings and fledglings. Incubation of the usually two, whitish eggs (28 x 23 mm) takes 22-25 days, fledging 56-64 days, and fledglings are fed for a further 2-3 weeks. 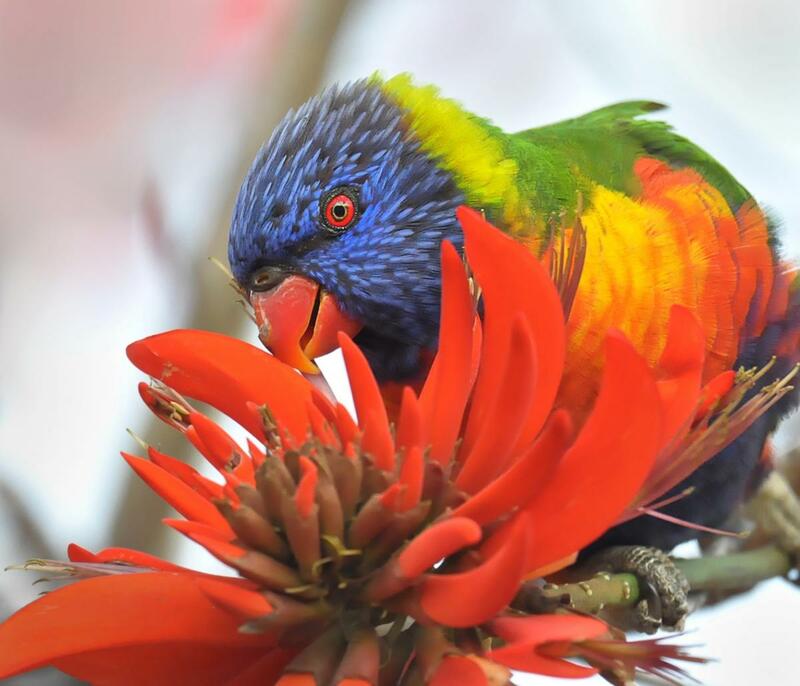 Rainbow lorikeets are prolific breeders, capable of rearing as many as three broods in a season, and can breed when 12-15 months old. 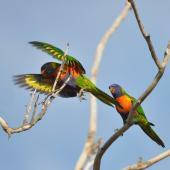 Rainbow lorikeets are active, noisy and colourful, and may occur in large sociable flocks once established. Feeding flocks are usually fewer than 50 birds, but can be up to 1000 or more. 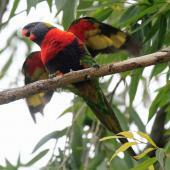 They are strong fliers, travelling up to 30 km between feeding and roosting sites. 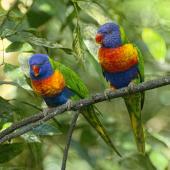 They are usually seen in fast-flying pairs or flocks, feeding and roosting in tree tops. 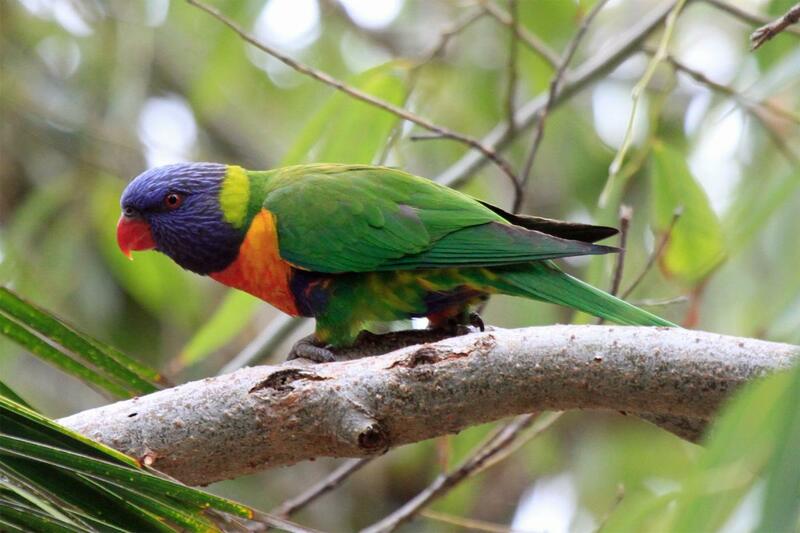 Rainbow lorikeets rarely come to the ground unless habituated to supplementary food, when they can become very tame. Traditional communal night-time roosts in large, isolated trees may be used by thousands of birds outside the breeding season. 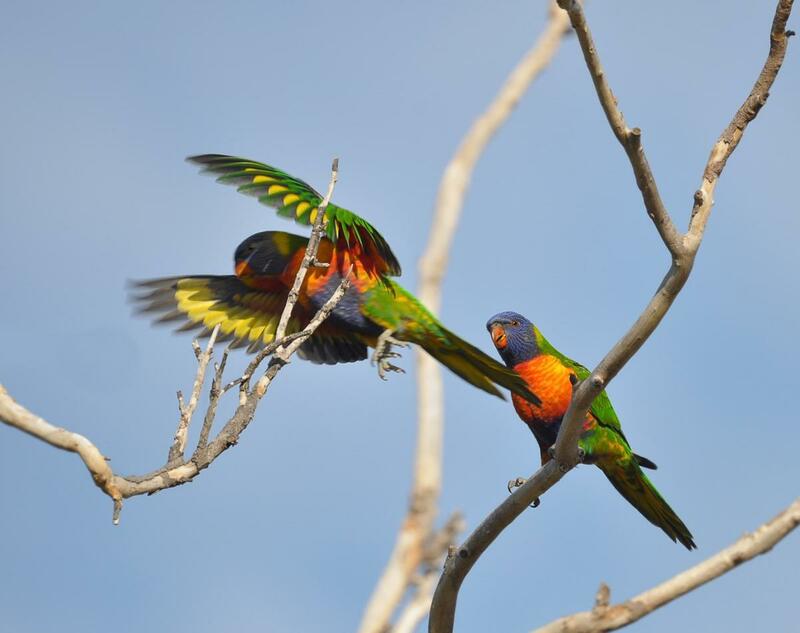 They are aggressive to conspecifics and other parrots and honeyeaters competing for the same food source, and have been observed dragging nestlings of other (Australian) parrot species out of tree hollows when competing for nest sites. 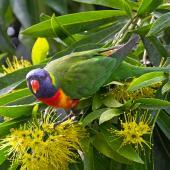 Rainbow lorikeets feed mainly on nectar and pollen in the outer canopy of trees. They also take fruit, seeds, and occasionally insects. 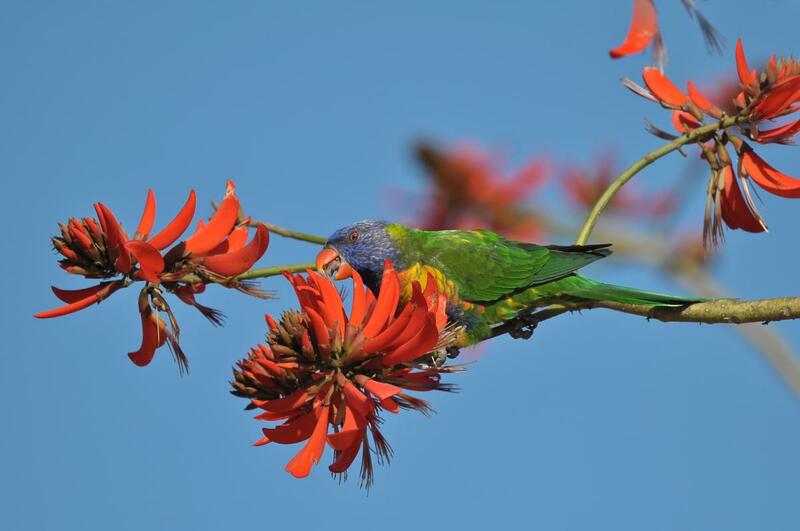 Rainbow lorikeets are acrobatic feeders, often hanging head down to access flowers and fruit. 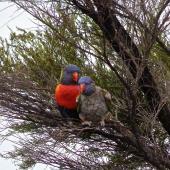 Brightly coloured medium-sized parrot with red bill and blue head.